Login to your HappyFox Chat Account. Copy the Installation code by clicking on "Copy to Clipboard" button. Login to your Drupal admin account. Go to Configuration-->Content Authoring-->Text Formats. 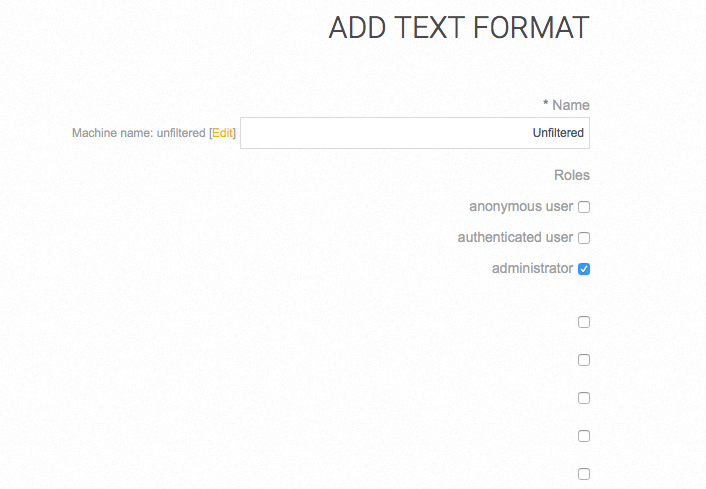 Create a new text format by clicking on 'Add Text Format' button. Name it as "Unfiltered" and have Administrator check box enabled and other check boxes disabled and click 'Save' button. Name the block as "HappyFox Chat" and description as "Installation Code for HappyFox Chat Code". Paste the HappyFox Chat Installation code in the body section of the block. Below that, change the text format to "Unfiltered" type and click on 'Save' button. Now, on HappyFox Chat block and select 'Footer' from the drop down list and click 'Save' button. That's it and you should now be able to see the HappyFox Chat widget appear on your Drupal website.